Alright folks, time for a new installment of "Beer Travels" which is all about the fun places to drink beer outside of Baton Rouge. I'd say the majority of these lately have been from Houston, and this one is only technically an exception as the ironically named No Label Brewing is located in Katy, a western suburb of Houston. Last Saturday Mandi and I decided to go take in their 1-3PM tour/tasting and were met there by my cousin Philip. The place is a little tough to find if don't have good directions, located in an old grain silo compound just on the north side of Hwy. 90 in old-town Katy. After we figured it out, and parked in the large open lot the "brewery" was right there in front of us. It was a beautiful day and I was excited to try some beers and make it 5 brewery visits on the year! The tasting was free, so after showing some ID (yes, Mandi is over 21) we had to wait a few minutes for 1:00 to roll around. They were selling shirts and pint glasses, so we each bought a No Label pint glass for the tasting. Similar to other tastings if you purchase a pint glass they will fill that up instead of the 4 ounce or so standard tasting. I'm not sure I saw a single person without a pint glass in hand! At 1 PM the beer started to pour so I started out with the Ridgeback Amber Ale, one of the two No Label Brews I hadn't tried before. Not a bad beer at all, a murky extremely sessionable tasty amber ale. I'd go back for more of these without thinking twice... and in fact I did! After that I went for the other beer that I hadn't tried before, the Black Wit-O, a dark wheat beer with a hint of anise for a bit of a licorice kick. It's also a 7% alcohol beer so only one was enough of this guy. After that one I tried two that I've previously tasted at The Petrol Station... the El Hefe Hefeweizen and the Pale Horse Pale Ale. Both are fine examples of the style and equally refreshing on a warm summer day depending on your tastes. The really neat thing about the whole tasting/tour was the laid back tailgate atmosphere of it all. People were showing up with pop-up tents and bag chairs and lawn games as they chilled and drank some brews. And there were also a good many LSU fans present as is typical with the Houston area. All in all it was a great time and I highly recommend it to anyone looking for something to do on a Saturday in the Houston area. Thanks No Label for a great time at brewery visit #5 on the year, and I'll definitely be back. Alright, a couple of beers from Twisted Pine Brewing. I was hooked up with the Hoppy Boy IPA by Clark Diehl at Uplifters Spirits, who specializes in German (and specifically Bavarian) imports, but he threw one of these in along with some of the German beers he gave me. Thanks for that! Twisted Pine brewing is out of Boulder, Colorado and I'm pretty sure I've seen the Hoppy Boy around town, but I don't recall seeing any of their other beers locally. The other one in this post, the Northstar Imperial Porter, was one I picked up in Spec's in Houston. For the Hoppy Boy I poured from a 12 ounce twist-off bottle into an imperial pint. It's a hazy copper color with a small white head. Good pooling on the surface of the beer, an average look for an IPA in my opinion. The aroma is expectedly hop forward, with piney notes dominating. There is a slight bit of caramel back there as well. The taste is more of the same, bitter hops, not as much malt as the aroma, and a lingering bitter aftertaste. It's a little thin, overall an average IPA. I scored it a C+ which is maybe even a little low with the standard beer advocate inflated ratings, but I feel like this could be a good barometer for IPAs. If you find one worse than this one, it's not a good IPA. That sounds worse than I intend, but life is too short to regularly drink bad beer. Or maybe even average beer. Now for the Northstar Imperial Porter... this one I picked up at Spec's in Houston on a whim. Sometimes they have such a huge selection that it's hard to pick out just a few beers and not go crazy so I usually stick to breweries that I know consistently put out good products. I poured this brew from the bomber bottle (22 oz. folks!) into an imperial pint glass. It's a deep rich dark brown color with about a finger worth of creamy tan head. This is a great looking beer in my opinion. The aroma is a little weak but what I do pick up is some roasted bitter dark chocolate malt notes. Nothing too special here. The taste is a lot more bold, those same roasted malt flavors burst through and are followed by a cool bitterness that really balances out each sip. It's thick and full bodied, the flavors linger well together on the tongue. Other than the weak aroma this is a really good beer. So I guess it's a little mixed reviews on Twisted Pine Brewing... I'd definitely check them out again if I saw a beer that looked particularly interesting. I split it among a few friends and totally forgot to take a picture, so I'm stealing this one of the label from the internets... hope no one minds! The color is a brilliant ruby reddish brown, decent head, off white with some good retention and lacing. So far so good, another good looking brew from the monks. The aroma is very complex... roasted caramel, dark fruits, a little bitterness from the hops, more roasted malt flavors, all blended together well. It definitely tastes more Belgian than German, and yes I know these guys are Dutch, but they brew Belgian-style. The taste is a lot of the same flavor as the aroma. Very complex and layered, with different sweet notes combining with bitter hops flavors over a nice toasted malt base. Man, a really interesting and good beer. The mouthfeel is pretty solid too... not quite as good as the previous categories, but it's a full bodied easy drinking beer for 7% with little alcohol taste to it. 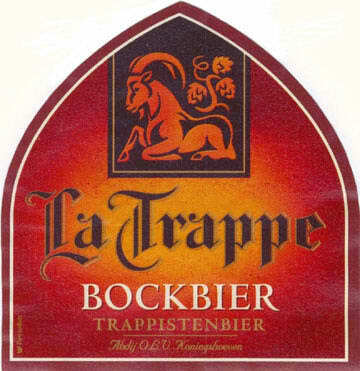 Overall, it's an interesting Belgian-style take on this German style. It definitely varies from traditional bocks that I remember with much more rich flavors. Alright, time to finally feature one of the best places in Baton Rouge to get a bottle of beer, The Cove on Corporate Blvd. It's a rather nondescript place on the outside, tucked into the corner of a shopping center near Jason's Deli and Albasha, but the high-ceiling interior really gives it an interesting atmosphere. there's a new scotch & cigar bar on the immediate right-hand side after walking in that I haven't had a chance to check out but I have a scotch tasting coming my way! Maybe I'll take a break from writing about beer to give that a proper review in the future. Two Epic beers from New Zealand. Carrying on, the hallway opens up into the main bar space, with a long bar backed by all sorts of whiskeys, other liquors, and lots and lots of bottles of beer. Seriously, a LOT of beer, mostly imported because it's just a lot easier to get different imports than it is to get various domestic microbrews. There isn't anything on tap so it's bottle only and some can get quite expensive. Even for me the beer list can be intimidating at times, but it's usually not hard to pick out something I've never had for a reasonable price. A MOA beer from New Zealand at The Cove. One of the main reasons I end up at The Cove is that the homebrew club I'm a member of, Brasseurs A La Maison, holds the monthly meetings there. They are always accompanied by a tasting of a specific style and we almost always do a little pre and/or post-drinking at the bar. Nothing wrong with that, right? An Epic / Dogfish Head Portamarillo, along with a Nogne O collaboration DIPA. All this leads up to, of course, that if you're really looking for some crazy imported beer, The Cove is the place to go in Baton Rouge. Time for a quick look at Cigar City, a brewery out of Tampa, FL that I've had the opportunity to try a few times recently. Apparently the brewery takes its name from the nickname of Tampa, which was unbeknownst to me until I started trying their beers. I would have thought Miami was the "Cigar City" of Florida, but nope, it's Tampa. Go figure... anyway, my neighbor Roy went to Florida on vacation not too long ago and was nice enough to bring back a few different Cigar City beers for me. Right on, man! They included three of the regular lineup, the Jai Alai IPA, Maduro Brown Ale, and Cubano Espresso Brown Ale. Of the three I have to say that the Jai Alai has been my favorite! It's a citrus-hopped IPA with a great balance of a little caramel malt. The brown ales left me a little disappointed... neither were bad but they didn't live up to all the hype. I really felt like the Cubano Espresso Brown Ale flavors clashed more than they augmented each other and the Maduro had a little bit of an off-putting metallic flavor to it. I found both beers interesting but neither would be ones I would seek out again. Well, unless I can try them on tap next time I find myself in Tampa... I have a feeling they would be far better that way! They also look to have a pretty impressive line of bombers and specialty beer in addition to these regulars. I'm by no means giving up on this highly rated brewery, I'll just check out some of their other beers next time. Mmmmm, Zwanze day! For those that actually read the Washington Post article I posted recently about the black market beer trade, you might remember a mention of the Zwanze beer from Brasserie Cantillon in Belgium. Brasserie Cantillon is one of the world's leaders when it comes to spontaneously fermented Belgian ales and one of their annual releases is the Zwanze. After 2010 bottles popped up on e-bay for 10x or more of the retail price the brewer decided to release the 2011 version on tap only at select locations throughout the world. Out of the approximately 20 locations worldwide that had the beer, one of them was right down the road, The Avenue Pub in New Orleans. To help relieve the mass of people expected to be lining up for some of the beer, Polly had everyone sign in in groups (of 30 I believe) and then go to the upstairs bar in the smaller groups to try some beers of their choosing. A $12 ticket afforded anyone two pours and although there were other Cantillon beers available I believe most people went for the 2010 Zwanze (Polly had some bottles!) and then the 2011 Zwanze. Prior to the official release party which started at 2 PM we ordered up some of the other Belgian ales that Polly had made available! Finally it was my group's turn and we started off with the older 2010 Zwanze that had been set aside in bottles. It was a blonde color with a fruity Belgian sour funk just as I expected from this one. After trying that and receiving our Zwanze 2011 pours it was out to the patio to avoid the crowds from the next group coming in. The Zwanze 2011 was a lot different than the 2010 version and I think most people I was with preferred the older 2010 beer. They weren't the same style so it was hard to compare, but I think I enjoyed the 2011 version better. It was made with Pineau D'Aunis grapes used in some red wine making in that area of Belgium. Since I really enjoy a good red wine I thought the beer was fantastic but I can see how others would like the 2010 better. In addition to these Belgian sours I was able to finally try the NOLA Smoky Mary and the Abita Select Honey Rye, which served as a nice changeup on the tastebuds to all the Belgian sours! Thanks again to Polly and everyone at The Avenue Pub for a fantastic time at Zwanze day 2011! Beer Events: ARToberfest in Ruston - October 13th. Hey everyone, I just wanted to pass the word on about a Louisiana beer festival and homebrew contest. It's called ARToberfest and is put on by the North Central Louisiana Arts Council. Here's a link to the facebook events page, and I've been told they will have a few beers from Texas that aren't readily available in the state yet, so it's always good to have new beer options to try! I think, like many beer festivals in our area, the real beers to try first are the homebrews. They tend to be the most exciting and different of all the beers available as the local "beer artists" show off some real brewing creativity. There will also be some Rahr & Sons gift packs available as a raffle to anyone there! Plus, proceeds from the event will benefit NCLAC's 13th Holiday Arts Tour, with an estimated economic impact of $64,480 in 2009, according to the event page. This year's tour is set for Nov. 18-20. Nothing wrong with some beer for a good cause, right? I'm getting close... be visitor number 30,000 and then take a screenshot, send it to me, and win free beer! I'm not sure what, depends on what I have available when you claim your prize, but it'll be something good and probably also some homebrew! For those who aren't computer savvy, hit "print screen" and then paste it into MS Paint to save a screenshot. 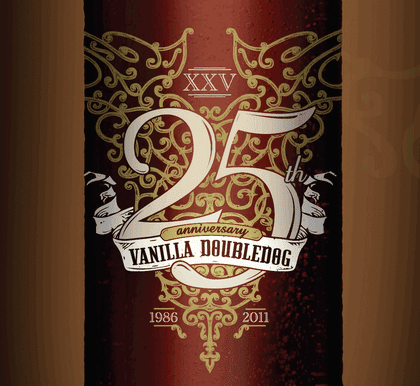 Late notice, I know, but the official Abita 25th Anniversary Vanilla Doubledog release party will be tonight, from 7-10 at The Barley Oak in Mandeville. Here is the link to the event details on Abita's site. There is also a Facebook event page for those more Facebook inclined. The good news is, even if you can't make it tonight, this one will be out in bottles before too long. I'd bet on 2-4 weeks before see them around Baton Rouge, and maybe even on tap at a few places too? Review to come once I actually get to try this one, but at least we know this long-rumored brew is a reality! Update: internet rumor has it that bottles are already on the shelves at Matherne's on Highland, so 2-4 weeks is way off. I'll be looking for them even sooner! Alright, time for a quick review since I'm perpetually behind in just posting beer reviews here and there. First off, a few basics. Yes, this beer is available in Baton Rouge at many of the local stores. I got it through Eusebio who I'm pretty sure picked it up at the Bet-R store. Also, yes it's actually an Irish beer, from the Carlow Brewing Company in Bagenalstown, County Carlow, Ireland. They also make an O'Hara's Irish Stout which has a B+ overall rating on BeerAdvocate. That's not bad at all and I've seen it around BR. They make a few other brews too but I haven't seen them locally. As for this one... I poured from a 12 oz. bottle into an imperial pint. For a good session beer like an Irish Red Ale or Irish Dry Stout there's nothing wrong with a standard pint glass. It's a clear deep reddish brown color with a huge frothy head. It really takes a while to dissipate and left good lacing. Great looking beer, so this one is off to a good start! The smell is strong and malty with hints of toffee and a small hint of hops. The taste is the same basic flavor profile as the aroma, but not as robust. If anything, the hops come through a little stronger. It definitely came across more bitter after a second sip. It's a little thin, but this is a very drinkable sessionable Irish red. Not bad at all, and another above average import from the Emerald Isle. My friend Blake, the head of Brasseurs De La Maison, recently sent me this article about black market beer and it got me thinking... have I ever done this? Honestly I think the answer is no... I've definitely looked at e-bay before to see if I could get some Westvleteren 12 cheap, as it's considered the best beer in the world by many but I've never pulled the trigger. Some of these rare US released go for hundreds of dollars and as much as I'd love to try all the different beers out there, no single beer can possibly be worth hundreds of dollars. Anyway, just wanted to pass this article on, it's an interesting read about some of the dirty side of craft beer enthusiasts. I know I'd try it... BrewDog announced on their blog the plans for a 28% fully fermented beer called "Ghost Deer" that will be served on tap through a stuffed deer head. Yeah, you read that right... here's the picture! Unfortunately this is only going to be available at the Edinburgh pub... dammit! 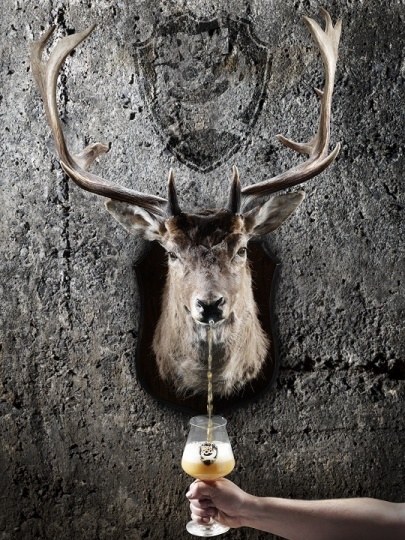 I'm not sure what to think about the deer head (some sort of European stag I'm sure) as a tap, but the guys at BrewDog are pretty serious about taxidermy and this wouldn't be their first beer to be served via the art. Unlike the crazy strong Tactical Nuclear Penguin and Sink The Bismarck, this Ghost Deer is fermented fully to achieve the 28% alcohol rather than a process where they freeze the other beers and skim the ice (water freezes first) off the top to concentrate the alcohol. I won't have the chance to try this one, but I like that breweries out there are doing this stuff!